Hephesto's Forge: Let's hope my necromantic powers are still up to par! Let's hope my necromantic powers are still up to par! 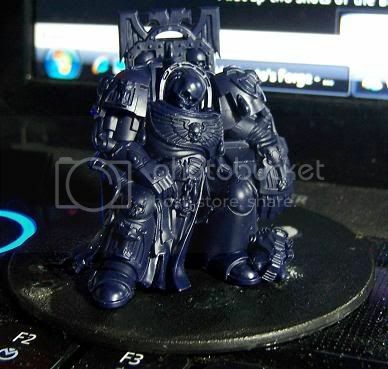 A little while back I was checking out a post by fellow Relictor fan Siph_Horridus on the Weemen blog (excellent stuff all over this blog, I can highly recommend everybody to go and check it out) where he was showing his plans for another thematic objective marker - the excellent dead terminator on throne found in the new Space Hulk set. - each chalice alone comes with a whopping 9 blood drops on it! But here comes the real kicker, I want to do some necromancy on this mini and put some life back into his eyes. The plan as off right now is to use the bigger base shown in the picture above (old Carnifex base), make the throne larger and probably a bit taller and do some massive cutting and rebuilding to turn this guy into a living Relictor terminator. Yes, it may be utterly idiotic to sit down on a throne in the middle of the battlefield and wait for your buddies to comes and pick you up.....I'll have to find some kind of fluffy reason for him to be sitting there, but right now I am just interested in this challenge. The really weird ideas have already gone, so no flying pyramid-like thrones this time round I'm afraid. Cheers for the shout. Good luck with the mini. I'm still filing and cutting those blood-y drops!